A state-of-the-art grooming aid and conditioning product for smoothing out the hair/coat, relaxing waves, "cowlicks" and curls, helps repair damaged coats, blocks the humidity and static and tames those frizzies. Adds texture, natural shine from citrus, and improves manageability. 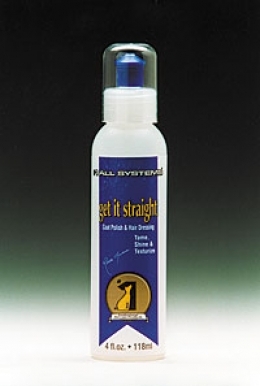 Get It Straight Coat Polish & Hair Dressing contains silk amino acids, sunscreen, panthenol, special conditioning emollients. May be used on clean freshly bathed wet or dry coat. Shampoo and condition with your favorite # 1 All Systems products; to maximize the conditioning benefits of the Get It Straight Coat Polish use the # 1 All Systems Product Stabilizer in between your shampooing and conditioning rinse process. Get It Straight Coat Polish may be applied to dry or wet coat, work small amount into hair/coat and dry/style in the usual fashion. Alcohol free, preservative free, fragrance free, no artificial colors or dyes!